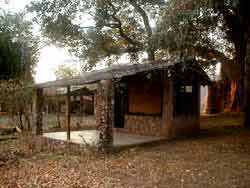 We often go to RIFA an educational conservation camp on the Zambezi. We look after the children who go on a weeks course. There have been a number of caretakers and at one stage they stayed in the cottage we now occupy when we are there. Some time ago an old man lived there - he had a false leg and it did not fit very well. Unfortunately he passed away while at the camp. We now often here the door being tried and the sound of a man walking around with a definite limp!